As new government regulations are introduced and new local working practices are adopted more and more new systems are being introduced to residents and to businesses within local authority boundaries. This can often lead to confusion for the residents and businesses which can create headaches for the local authorities as the wrong bins are left outside houses or cars are parked in the wrong places and so on. In order to avoid these headaches we produce custom-made information wheels and data discs such as the parking disc, parking permit and recycling wheel. These are local authority products which can help to make life easier for residents, businesses and local authorities alike and provide bonus marketing opportunities for businesses in the form of ambient car advertising in car to local residents. We supply local authorities and private companies throughout the UK with parking disc and parking permits solutions to their individual needs. 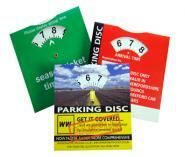 The standard parking disc as described in BSI guidelines is by far the most popular at a size of 125 x 125mm. More and more Councils and private companies are starting to feature advertising on their parking discs and parking permits creating a sort of in car promotion in an effort to boost revenue and make their budgets stretch a little further. This represents a terrific ‘in car' marketing opportunity for companies associated with motoring: car dealers, breakdown services, auto insurance companies, tyre and exhaust centres, windscreen replacements, body repairs and so on. Where restricted parking rules apply and only drivers holding a parking permit are allowed to park in those areas we supply attractive and hard-wearing permits. 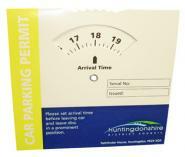 If you run a resident’s only scheme where resident parking permits are applicable our range of in car promotional products include those too. We produce disabled parking disc or disability parking disc products for easy access to disable parking zones. It could be a scheme where parking is restricted to emergency vehicles only or maybe to council workers only. Whatever type of scheme is in operation we can produce a data wheel or information wheel to suit your requirements. As more and more councils are changing old fashioned waste collection services into sophisticated waste reduction and recycling operations your residents sometimes become more and more confused about what goes where and so on. A recycling guide in the eyeleted disc format is a relatively new phenomenon but they are catching on and they really do offer household residents help with recycling. There are no BSI guidelines for this recycling information product and our own “What Goes Where Wheel” recycling wheel can be changed to suit each local authority’s own preferences. 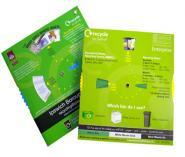 Fully customised to suit your colour schemes we help you all the way with your recycling guide. 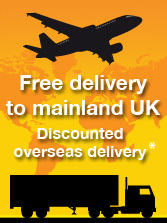 As well as producing a range of eyeleted products for local authorities, we also produce a number of items for other businesses too. 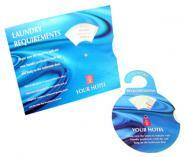 For example, with all the recent focus on hotel water conservation we have developed 2 versions of laundry wheel charts which allow hotel guests to reduce the amount of laundry a hotel produces – a Laundry Tent Card for placing on a vanity unit and a Laundry Wheel Door Hanger version. Offering print area for you to advertise other hotel facilities these products are not only helping you to save water and money but are welcomed by both your guests and your house-keeping staff too.